Welcome to the Astoria Column! You can climb the 125 ft high Column and see breathtaking views of the Pacific Ocean, Columbia River, Saddle Mountain and the Clatsop Plain. 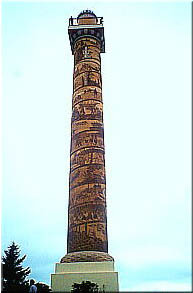 The Astoria Column, dedicated in 1926 was patterned after Trajan's Column in Rome by architect Electus Ritchfield. The mural that spirals up the outside of the column was created by Italian artist Atillio Pusterla, and shows scenes and figures of the westward expansion of the settlers and Oregon's early history. 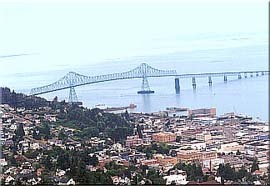 The beautiful city of Astoria (along with Warrenton) is located on the Pacific coastline in the northwest corner of Oregon, in Clatsop County. Astoria and Warrenton are located on the Oregon side of the Columbia River, where it meets the Pacific Ocean. Astoria is the oldest American settlement west of the Rockies. It was first visited by Captain Robert Gray in 1792. Followed by the Lewis & Clark Corps of Discovery in 1805, then other pioneers later. Astoria's 20 mile radius consists of Fort Clatsop National Memorial, Fort Astoria, Fort Stevens State Park, Heritage Center Museum, Flavel House Museum, Uppertown Fire Fighters Museum, Astoria Column, and the Columbia River Maritime Museum. The Astoria Bridge is 4.1 miles long! Historic Victorian homes, quaint shops, galleries, docks, cruise ships, and fishing charters also make up this beautiful coastal town. Enjoy the city's waterfront along with 17th Street Pier, 6th Street Viewing Dock, and the 14th Street Riverpark. Also, visit Uppertown Firefighters Museum. Astoria's population is aprox. 10,850. Warrenton/Hammond is aprox 3,950 and Clatsop County consists of aprox.35,000. The Climate is mild year-round with a Average Wind Speed of 8.5 miles per hour and the Normal Annual Precipitation is 62.60 inches. Celebrate Astoria's Scandinavian heritage with the Scandinavian Midsummer Festival that is held in June. This festival features authentic Scandinavian events, musicians, smorgasbords, parade, ethnic entertainment, dancing, and crafts. The Friends of Astoria Column is a citizens group that was founded in 1988. They are dedicated to maintaining and preserving this historic one-of-a-kind monument. Due to their tireless efforts, and through the generous support of individuals, foundations, and corporations, the Column underwent extensive renovation in 1995. The pictoral frieze is once again legible, and has been impregnated with a water repellent that should help to preserve it. Plans are under way to establish an Interpretive Center. The highlight of the Center will be a scaled-down version of the Column. A staircase will wind around the outside of it in order to allow close-up views of the 14 scenes. The Center will also display information about the Column, its history and purpose, and other exhibits about Oregon history and the settling of the region. If you wish to contribute to this worthy cause, you can join Friends of Astoria Column by making a donation through the box at the Column, or by mailing it to PO Box 717, 1095 Duane Street, Astoria, OR 97103. If you would like to obtain additional information, please call 503-325-4530 or send a fax to 503-325-2467. Featuring changing exhibits that are designed to capture the imagination of children of all ages. For more info, call 325-8669. A display are hand-pulled, horse drawn and motorized vehicles, fire fighting equipment and memorabilia. This extensive collection of fire fighting equipment makes this museum fun for kids of all ages. National history, regional history, geology, important nautical events and Native American artifacts. Elegant Victorian home listed on the National Register of Historic Places & built by Captain George Flavel. 24,000 square feet of exhibit space with 7 galleries that display the region's maritime history. Also, a huge collection of artifacts, models, displays and paintings. Winter quarters for Captains Meriwether Lewis & William Clark. Fort Stevens Military Reservation guarded the mouth of the Columbia River from the Civil War until World War II. Remains of English sailing ship ran aground during a storm in 1906. Artifacts and interpretive displays depicting the history of the fort from the Civil War era to the shelling of Battery Russell by a Japanese submarine during World War II.